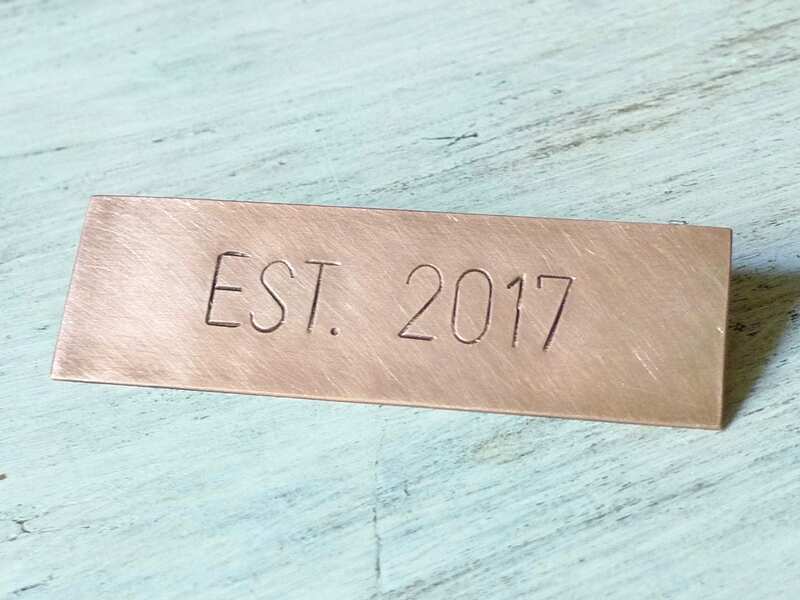 Small hand-stamped nameplate in aged copper. Made by hand-stamping each individual letter using a metal punch & hammer, variations in alignment and spacing is part of the charm of this old school technique. Photo is a sample. Please read all instructions below before placing your order. •Measures approx. 3.25 x 1 inches (8 x 2.5 cm). 👉Need more characters? Choose one of my other plates with smaller font or contact me to request a larger plate size. Please include your text with your custom order request. INCLUDE YOUR TEXT in the notes to seller when purchasing. Review your text carefully before submitting your order. There are no refunds on personalized items unless a mistake was made by the seller. Spellbinderie is located in France. Orders ship via priority mail with tracking.